Please read the following rules carefully and completely. We expect all of you to follow these rules. We have a very tight program to accommodate all those who want to participate in the program. We are requesting all of you to adhere to the following rules so the program can go smoothly without any delays. We appreciate your understanding and cooperation. 1. Please arrive at the venue at least 30 minutes before your scheduled time. If you are late for your performance you will have to wait till the end of the program to perform, if time permits. 2. Your performance schedule is based on your registration (first come first served basis within that hour slot). Since you are able to choose your own time, please stick to that time and don't ask us to change your time. We need to be fair to all the participants. 3. Only Annamacharya Krithies are permitted. Niraval, Alaapanaas and Kalpanaaswarams are not permitted. 4. You will be seated by the volunteers according to your time of performance. 5. Please stick to your allotted time. If you go over your time (4 minutes) you will be reminded to finish. This is very important because we cannot afford to delay the program even by one minute. There are nearly 70 performances with more than 100 participants and we want to give all the registrants an opportunity to perform. So please stick to your allotted time. If you are bringing a sruthi box or playing Veena or Violin, please tune them before you go on the stage. 6. Participants who are performing in groups are requested to enter and exit the stage without any delays. 7. We expect all the younger participants to be accompanied by their parents or teachers. 8. Please remain silent when the performance is going on. Please respect all the other participants regardless of their age and performance. 9. If you are bringing children who are not participating in the program, please keep them next to you. If they are restless, please take them outside the hall. Children will not be allowed to run around the hall. 10. Please do not bring any large items, other than your musical instruments, into the main hall. 11. If you are bringing a CD for your dance performance, please give it to the person who will be handling the sound system 30 minutes before your performance time and remember to take it back from them. 12. 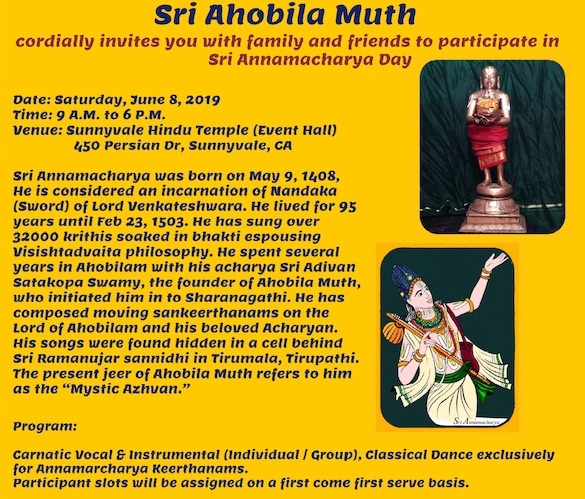 Sri Ahobila Muth would like all the performers to be in traditional Indian clothes.